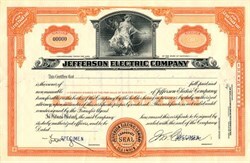 Beautiful engraved specimen certificate from the Jefferson Electric Company . This historic document was printed by American Bank Note Company and has an ornate border around it with a vignette of an allegorical woman. This item has the printed signatures of the Company's President, J. M. Bennan and Secretary. 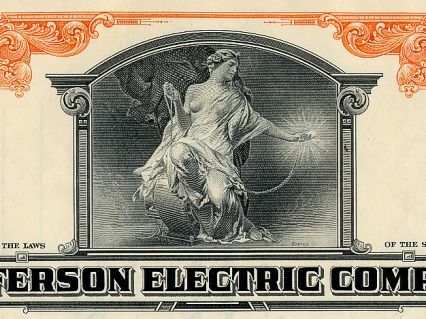 The Jefferson Electric Company was founded January of 1915 The Company was named after President Thomas Jefferson, who was also an inventor. They made bell ringing and toy transformers and similar devices. By 1921, their major product was a magneto lamp regulator for cars. They also expanded into radio transformers in 1924. Golden Hour Clock Production Began in Late 1949. In 1967, Jefferson was purchased by Litton Industries and became Jefferson Electric, Division of Litton Industries.